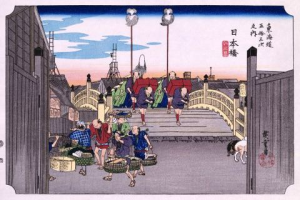 The 53 Stations of the Tokaido, Hoeido Edition, published in the late Edo Period, was a series of ukiyoe illustrating the 53 inn towns that were established by Tokugawa Ieyasu to connect the 495 km between Nihonbashi in Edo with Sanjo Ohashi in Kyoto around 400 years ago. The vivid blue color known as Hiroshige Blue and the bold compositions are said to have influenced even Van Gogh and Monet. We bring you Utagawa Hiroshiges masterpieces that enthralled the world, in high resolution images.